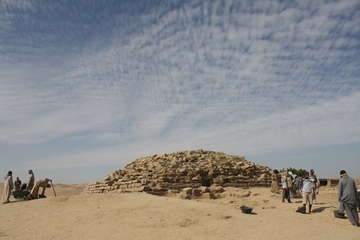 TORONTO, ONTARIO—A step pyramid dated to 4,600 years ago has been uncovered in southern Egypt, at the ancient settlement of Edfu, by a team led by Gregory Marouard of the University of Chicago’s Oriental Institute. One of seven “provincial” pyramids constructed before the Great Pyramid of Giza was built, the Edfu pyramid was made of local sandstone blocks and clay mortar, had no internal chambers, and may have been dedicated to the royal cult of the king. “The construction itself reflects a certain care and a real expertise in the mastery of stone construction, especially for the adjustment of the most important blocks,” Marouard said at a recent meeting of the Society for the Study of Egyptian Antiquities. But less than 50 years after its construction, offerings were no longer made at the Edfu pyramid. Scholars think that the provincial pyramids were abandoned when Khufu began work on the Great Pyramid.